Smyrna Wine. Put Eighteen Gallons of Water to One Hundred weight of Smyrna Currants, put them into a thirty Gallons Cask, stir it every day for Six Weeks, then bung it up close, & bottle it off at the end of twelve months. - Mr Usher. 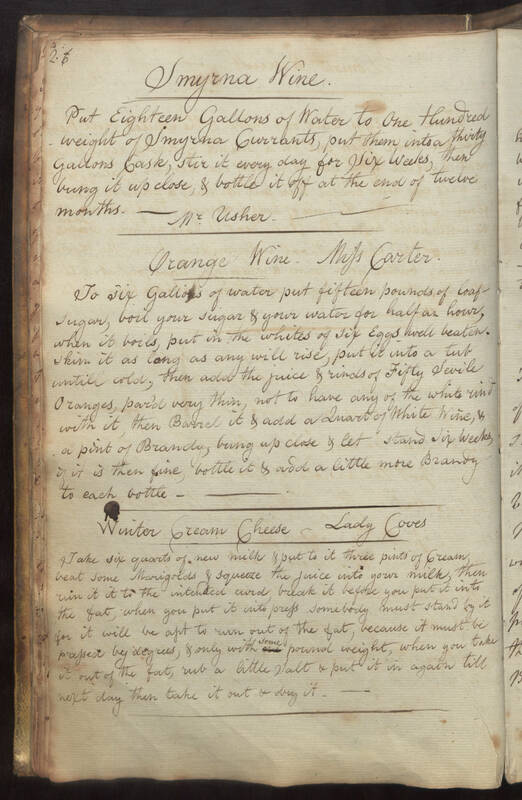 Orange Wine - Miss Carter To six Gallons of water put fifteen pounds of loaf sugar, boil your sugar & your water for half an hour, when it boils, put in the whites of six Eggs well beaten. Skim it as long as any will rise, put it into a tub untill cold, then add the juice and rinds of Gifty Sevile Oranges, par'd very thin, not to have any of the white rind with it, then Barrel it & add a Quart of White Wine, & a pint of Brandy, bung up close & let stand six weeks, if it is then fine, bottle it & add a little more Brandy to each bottle. Winter Cream Cheese - Lady Coves Take six quarters of new milk & put to it three pints of Cream, beat some Marigolds & squeeze the juice into your milk, then run it it to the intended curd, break it before you put it into the fat, when you put it into press somebody must stand by it for it will be apt to run out of the fat, because it must be pressed by degrees, & only with some pound weight, when you take it out of the fat, rub a little salt & put it in again till next day then take it out & dry it.